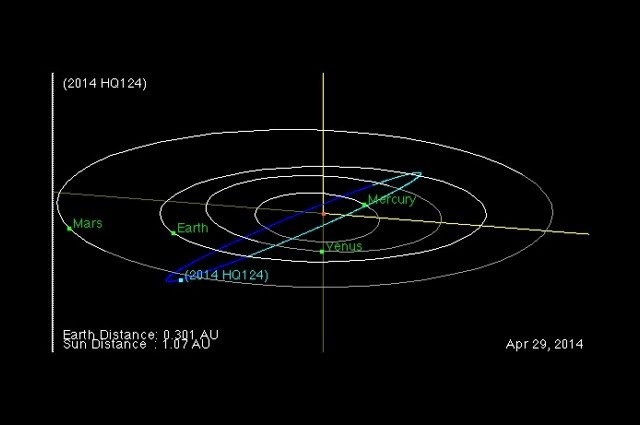 On June 8, asteroid 2014 HQ124 will be creating an approach with Earth at three times the distance of the moon, and it poses no risk of striking us. Good thing, since its 352 meters (1,100 feet) long. Scientists at NASA’s Wide-Field Infrared Survey Explorer (WISE) first discovered the behemoth on April 23. It is wandering 17 times faster than a speeding bullet at 14 km/s (31,000 mph) and is anyplace from 10-20 times bigger than the Chelyabinsk asteroid. If it were to influence Earth (don’t worry, it won’t) the impact would be on par with an H-bomb, releasing many megatons of energy, dwarfing the influence of an atom bomb. Obviously, it’s a little disturbing that an asteroid large enough to impose that much power was only exposed about six weeks ago, not that there is a hell of a lot we could do about it, even if we knew further ahead than that. In order to try and minimize the risk of our certain doom from asteroids, NASA and Slooh have teamed up for the Asteroid Grand Challenge, which empowers citizen scientists to help discover and monitor any asteroids headed our way. The folks over at the Slooh Space Camera are giving a preview of Sunday’sright now in a live webcast.